I'm using Idea 7 #7584. 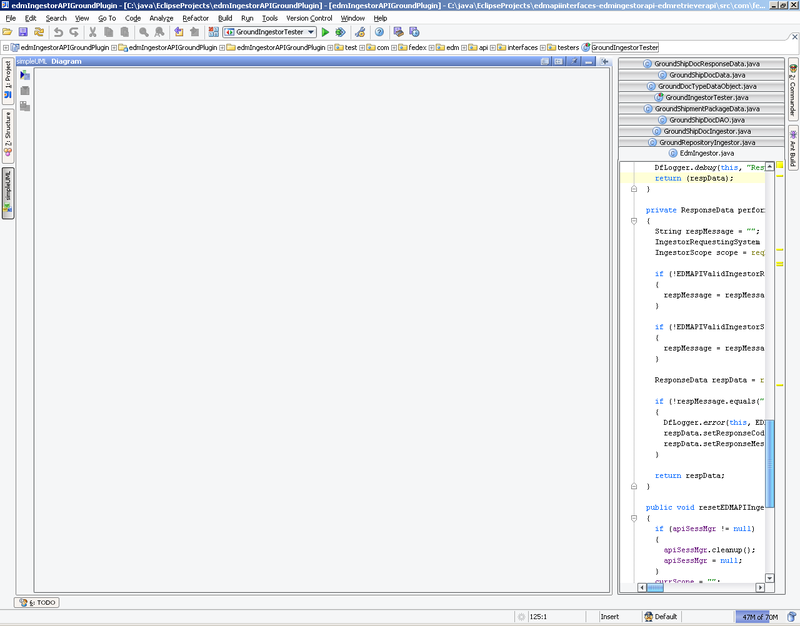 I'd like to reverse engineer my existing java files to class diagrams. How can I do it? I also installed the simpleUML plugin but I don't know how to use it to draw a UML diagram. It let me open existing diagrams only (but I don't have any existing diagram, so I'm not sure if that feature works). For simple code analysis, I like SimpleUML. There's a plug-in available via the Plug-In Manager. Once installed, you can select some classes and have them inserted into a new SimpleUML diagram. You can later add and remove classes, manually or automatically lay the diagram out, control which kinds of members of the classes are displayed and which inter-class relationships are displayed. Unless I'm mistaken, it does only class diagrams, so it's far from a complete UML solution, but I find it just right for getting a birds-eye view of some code. Might be more than what you're looking for, but I thought I'd mention it as I have found them to be good products. Could you tell me how to "select some classes and have them inserted into a new SimpleUML diagram"? My question sounds very stupid, but ... I don't know how to use this stuff. Its website doesn't have anything to help. You can have a look at my idea screen shot. have them inserted into a new SimpleUML diagram"? You can open the popup menu on a class in the project tree or on an identifier in the editor and select "Add to simpleUML diagram"-->"New Diagram", Select Classdiagram and specify a name for the diagram. Start by opening the Project View (ALT+1 or Windows -> Tools Windows -> Project). Next, select one or more Java classes that are part of your project. Then right-click on one of the selected class names or icons to activate the context menu. Near the bottom of that menu is a sub-menu, "Add to simpleUML diagram...". When you start, the only entry in that submenu will be "New Diagram...". Select that command and simpleUML will create a default class diagram including those classes and will open a window to show them. Alternately, you'll notice that in the Windows -> Tool Windows submenu is an entry for simpleUML. You can select that command to get either the latest simpleUML window or, if there none, a new blank in which you can open simpleUML diagrams you saved earlier. Once you have a simpleUML diagram active, you can use the command icons along the left side of the simpleUML window (they have tool-tips to explain the iconography). There are also context menus for the diagram background and for classes shown within that diagram.